Cheryl Pope. 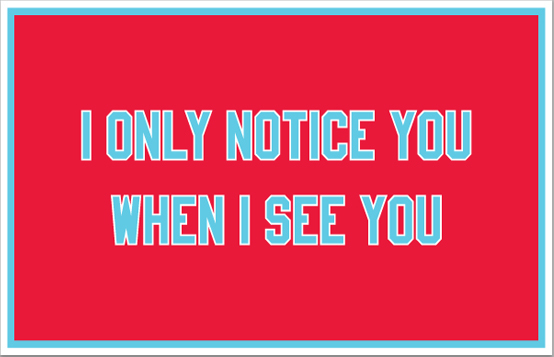 “I ONLY NOTICE YOU WHEN I SEE YOU,” 2015. Printed nylon banner, 36 x 60 inches. The exhibition begins outside on Division Street. There, the ruby red glow of Michelle Grabner’s painting “Untitled” from “Chicago Gingham” emanates outward through the street window and across the snow-covered sidewalk, enticing warmth and springtime nostalgia. Once inside, Cheryl Pope’s cheerleader-style banner work, “I ONLY NOTICE YOU WHEN I SEE YOU,” hangs facing the entrance, offering a lipstick red sentiment that foreshadows the exhibition’s curatorial mission. MMG’s intent is to defy the view that SAIC artists are bound by a regional aesthetic, and the exhibition successfully showcases the expansive conceptual considerations and formal range of SAIC alumni and affiliates. While Pope’s work taps into the rituals of high-school athleticism, Sanford Biggers’ culturally hybrid practice is evident in the pink deity-like sculpture, “Supposition,” which stands poised, seemingly for a religious offering, as a guardian in the front of the gallery. Beyond defying regionalism, the exhibition also awakens complex moments of cohesion amongst the artists. For instance, linear delicacy and textural complexity dance throughout many of the works. Karen Reimer’s linear tendrils and flecks of gold in “Geometry in Outer Space or Heaven” series call out to the haptic tracing and evanescent essence of Sheree Hovsepian’s “Muse Music,” located on the opposite wall. Sheree Hovsepian. “Muse Music, 2015. 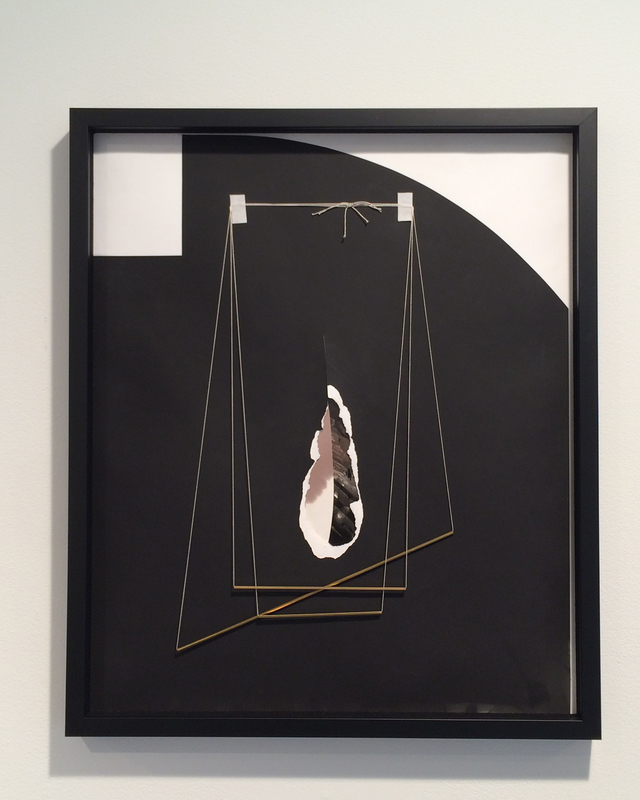 Silver gelatin photograms, tape, string, brass, 24 x 20 inches. A biting humor interlaces throughout the exhibition that pays homage to SAIC’s particular academic character. In the far corner, Justin Cooper’s light sculpture meanders upwards into space like a wilted totem struggling to perform its utilitarian duties as a light source. This side-smile sense of wit is felt again in the back room where Karen Reimer intervenes in the world of romance novels. Her rearranged text leaves one contemplating how words like “mermaid” and “mundane” could have such prominence in a book ostensibly about throbbing yearning and quivering attraction. Through January 30 at Monique Meloche Gallery, 2154 West Division.